Ethiopia is fast descending into turmoil as the result of incessant state-sanctioned violence and repression. 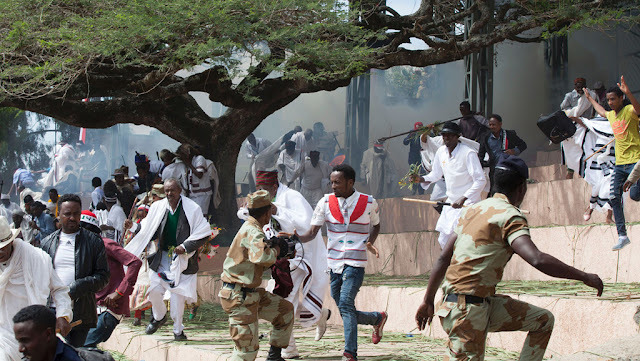 Popular demands that precipitated a three year-long protest, which started in Oromia in 2014 and then spread to the Amhara and other regions, remain unaddressed. The discontent in the two most populous regional states, Oromia and Amhara, home to two-thirds of the country’s population of over 100 million, is deep and widespread. The resulting anxiety, expressed by serious Ethiopia watchers, is confirmed by the country’s leader, Prime Minister Hailemariam Desalegn, who once warned that the continued protests could push Ethiopia into a situation similar to what has prevailed in neighboring Somalia for the last 26 years: state collapse. The international community can no longer hope that the regime can muddle through these crises as it has always done. This time around the gravity of Ethiopia’s collapse is qualitatively different from previous situations, not to mention deadly serious. The writing is on the wall: state collapse is on the horizon.